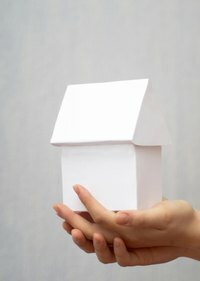 The techniques you will need to build model buildings will depend in part on what type of building you wish to produce. It's no good learning how to make a realistic cinderblock effect if you're modelling for the medieval period. However, many of the basic techniques remain the same, or can be adapted to suit any style or type of building in any era. The approach here is highly adaptable, quick and easy to implement. Mark out on the foamboard the shapes for the walls and roof of your building (the exact shapes you mark depend entirely on the building you are making), marking down windows and doors. Remember that the average height of a man at this scale is 1 1/8 inches, so a door should be around 1 2/8 inches, and a window around 1/2-inch square. Mark finger joints onto the edge of each wall. These are square sections that protrude and square sections that recede from the edge of the wall. The wall it joins has the opposite pattern cut into it's edge so the two edges are complementary and slot together. They do not need to be too fine, just two or three joints in the length of the wall. Cut the foam shapes out using the ruler and scalpel. Texture the roofs and walls. This depends on the material you are trying to imitate, but stone, brick and concrete can be reasonably well imitated by mixing a small amount of fine modelling sand with watered-down PVA glue and painting this onto the foamboard shapes. For plain concrete, allow it to dry before spraying gray, allowing to dry again and dry brushing (lightly brushing with a brush wiped almost clean of paint to pick out highlights) with white. For a brick effect, mark out the line of the bricks with a match stick, allow to dry, spray the appropriate color, dry brush with white and then paint into the cementing lines with grey. Make roof tiles if you are using them. Use the same approach as texturing the walls, but this time on a thin card. Allow to dry, then cut into tile shapes, changing the uniformity of their sizes and shapes to suit the style of building being made. Starting at the gutter edge of the roof, stick the tiles down in overlapping rows. Add detailing, such as doors and windows. Thin strips of balsa wood can be used to make the window frames. With a few cross pieces, there is no need to try and imitate the glass. Balsa wood can be easily scraped to give doors a panelled effect. Painting with ink can darken the wood without losing the grain. Guttering can be made by cutting narrow drinking straws in half and painting the appropriate colors. Stick all detailing into place and allow to dry. Slot and stick all the wall and roof pieces together and allow to dry.